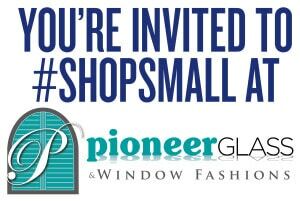 Do business with Pioneer Glass on Saturday, Nov. 29 and get 5% off your order! You must mention this discount to have it applied. You may combine this with other existing discounts at Pioneer Glass, such as our exclusive web offer of 10% off shower enclosures. Visit us in person on that day, e-mail us or make a phone call and you will get the discount, even if the order goes past Nov. 29 – just tell us you are shopping small! Want to #ShopSmall but can’t wait for Nov. 29? Just let us know, but a deposit or full payment must be made by Nov. 29 to qualify for the discount. We offer customized quotes and information, convenient in-house visits and professional installation services instead of having to go to a big-box retailer, try to figure out what works for you, flag down a worker to get the bare minimum of information, and blanch at the outrageous installation costs that bigger chain outlets demand. Further, spending locally ensures sales taxes are re-invested in the community and helps build a stronger local economy. Research shows that over 90 percent of small-business owners contribute each year to their communities through volunteering, in-kind contributions, and/or direct cash donations. That means your purchase of a good or service at a small business is a great way to “pay it forward.” Compared to chain stores, locally owned businesses recycle a much larger share of their revenue back into the local economy, enriching the whole community. Fox News and ISLR provided much of the content on the page.